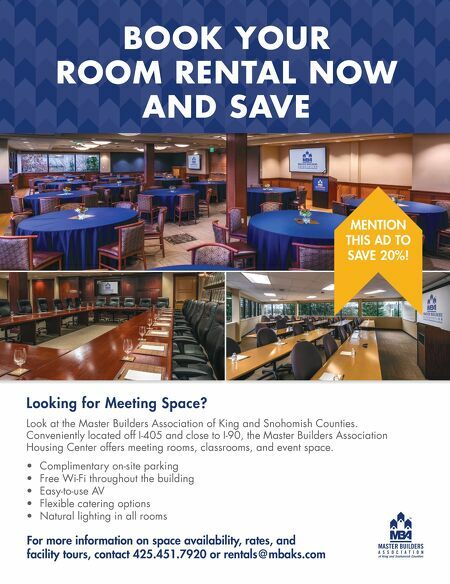 BOOK YOUR ROOM RENTAL NOW AND SAVE Look at the Master Builders Association of King and Snohomish Counties. Conveniently located off I-405 and close to I-90, the Master Builders Association Housing Center offers meeting rooms, classrooms, and event space. For more information on space availability, rates, and facility tours, contact 425.451.7920 or rentals@mbaks.com • Complimentary on-site parking • Free Wi-Fi throughout the building • Easy-to-use AV • Flexible catering options • Natural lighting in all rooms Looking for Meeting Space? MENTION THIS AD TO SAVE 20%!